If you can’t find the answer to your inquiry on the list below, do not hesitate to contact us. We are open 7/7. Deliveries/retrievals take place from 9am to 6pm. Where is our shop located? 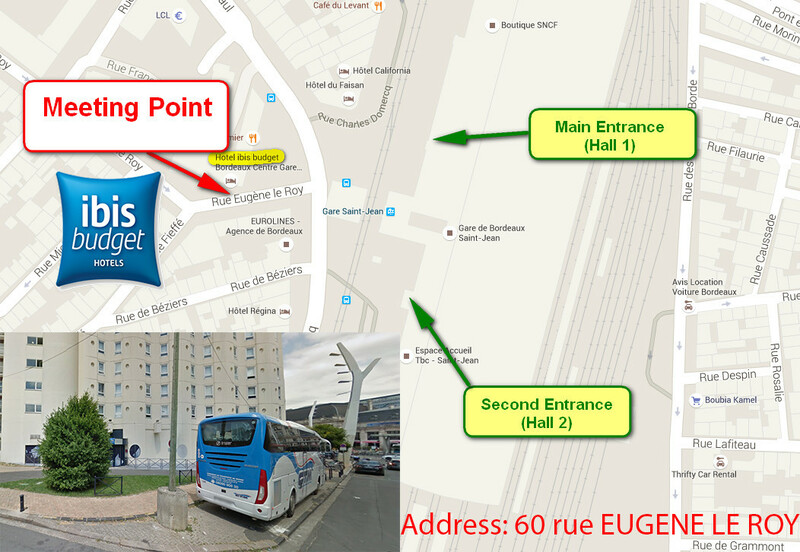 Our warehouse is located fifteen minutes from the Bordeaux city center. Given the distance and the lack of means of transports, it is not our general practice to welcome our customers. However, should you be motorized, delivery can take place in our warehouse by appointment only. In any cases, we deliver the bikes at your chosen address or by the train station (see next question). Where is our free meeting spot located? We meet you free of charge 100m away from the train station. The address is 60 Rue Eugene le Roy, Bordeaux. It is located in front of the Ibis Budget hotel main’s entrance. This a big white building with a blue square logo. The GPS coordinates are 44°49’33.481″ N 0°33’28.13″ W.
You can also download here a picture showing all these elements combined. How far away do we deliver and at what cost? Delivery at the Bordeaux Saint-Jean railway station is free of charge. For any other destination and address (Bordeaux and its suburbs, airport, South-West, France, Spain,…) we will give you an estimate. As we depend on the traffic, we kindly ask you to take into account a possible 30 minutes delay. Groups, long term or fidelity discounts do not apply to transportation fees. Is there a minimum/maximum rental duration? We are a micro-business company of 2 persons. We do consider that this small number enables us to offer you the best possible quality of service and communication. Furthermore, our rental fleet is limited owing to its value. For these reasons, we cannot accept rentals for less than 4 days from May to September included and for less than 2 days from October to April. A rental day starts at 9.00/9am the earliest and ends at 18.00/6pm the latest. Who to contact in case of a problem? If you are involved in a road accident or are injured, please call emergency numbers ( 112). If you have small mechanical problems, even though exceptional, we will do our best to give you the most suitable solution. However we do not fix punctures. You have to use the provided repair kit to fix them yourself. Thank you for your comprehension. Is it possible to extend/reduce rental time along the way? If you wish to extend your location, please contact us as soon as possible to check availability of your bike. In case you wish to return your bike before the due date, we will reimburse the remaining days only for serious reasons. What are the terms of cancelling? Our other services (route design, Tour Package, …) have a different cancellation policy. More information will be given by email. In case of damages or theft, do we cash the guaranty? According to law (Articles 1383 and 1384 of the Civil Code), the renter is personally responsible for road traffic offences and any physical injury or material damage caused to a third party while using the leased equipment in their charge. As a consequence, we will then apply a fixed amount against your caution, corresponding to the damages observed on the bike(s) and accessories. A scoring grid including the most damages is available on demand. In case of theft, the whole of the caution will be withheld. You will find more details in our general terms and conditions of rental. How should I lock the bike? Our locks, although solid, have a disuasive role above all. No solution on the market can totally prevent theft. For this reason, we formally prohibit the storage of bicycles outside at night. As soon as bicycles are no longer in use, they must be secured, including inside a car park, building,… To do this, attach the supplied locks to fixed points that are firmly anchored in the ground and high enough. Similarly, we ask our customers not to leave bicycles unattended, even if they are attached. You will find more details in our general terms and conditions of rental. Is an insurance included with the rental? Our insurance policy does not cover our equipment as soon as delivered. Your liability insurance or any other specific contract will protect you during the rental period. Is my bike the right size? You may notice that the size of the bike we picked for you is different from your usual bike. Why is that ? As your position on a racing bike will be different from a trekking bike (lean vs upright), the tubes which compose the frames have various lengths (e.g. longer headtube and wheelbase on a trekking bike). As the size is related to these lengths, they will be different too. If you ride racing bikes only, this is why the size of any other bike will seem wrong. e.g. a 180cm male rider would certainly ride a 56 racing bike but he will need a 52 trekking bike/e-bike. Your culture, gender and age should also be taken into account. -Eventually, the size may also vary according to the gender because of the leg/chest ratio. Women usually have longer legs than men. Finally, we have to take into account the manufacturer’s choices. At a given price, every brand is looking for the best bike possible. The shape of a bike is dictated by a unique combination of design and technologies that belong to that brand only. Which means that a “Bikedale” is different from a “Cyclized”, no matter if the size and product range are the same. If you do not ride a Cube Attain GTC SL 2018 at home, the size is likely to be different. For your information, our racing bikes are designed to be comfortable all-rounders and are quite compact. We invite you to check their geometry here and compare it with your bike’s. This way, we’ll be sure that you have the best position possible. The trekking bikes and E-bikes are less sophisticated (or is it related to the riders? 😊). They are all about the same size, no matter the brand. We have been renting bikes for many years now. We are passionate people, not money makers. We select our bikes very carefully. They have to meet all our expectations to serve our only goal: providing you with the best possible services and making your stay here a success. And we think that riding the right bike is the beginning of it. You can definitely rely on our experience. However, should you have a particularity that might affect our choice, do not hesitate to let us know! e.g. Norbert has short arms (=he prefers a smaller bike) while Jonathan has infinite legs (=he requires an extra-long seat post). Can I take the train with bikes? -bikes allowed providing a 10€ fee WARNING: Inside TGV, there is enough room for two bikes only per train! Beyond this limit, you can still carry it as a luggage, which means that you have to dismantle and store your bike inside a bag. Which accesssories are provided with every rented bike? Trekking and e-bikes are automatically fitted with lights, rear racks, and pedals. Road bikes are delivered without pedals. They can be fitted with rear racks, as optional accessories. Should you wish to have them fitted with lights, please let us know. Please note that we do not fix punctures. You have to use the above described kit to fix them yourself. Thank you for your comprehension. Why don’t we rent shoes? For hygienic and storage reasons, we do not rent shoes. As for the pedals, the large number of references on the market forces us to focus on the most common models: SPD, SPD-SL and Keo. Do we offer maps and counsels for your stay? We will be happy to lend you a paper map, A3 format. However, requesting a personalized detailed road map, falls in the scope of tailor-made itinerary. We will be happy to provide you with an estimate. Are French drivers cautious with cyclists? In France, drivers are pretty patient and cautious with cyclists. That being said, do not forget the basic safety and good behavior rules in order to share the road.